Arrival in Israel - all set to GO! NOTE TO FAMILY AND FRIENDS OF THESE PILGRIMS — please messages below in Comments and I’ll read them on the bus. Humor is always appreciated. 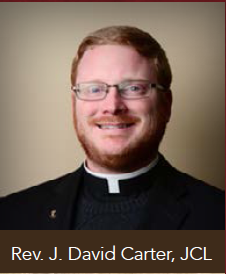 Homily at Church of Transfiguration here. Enjoy today’s video from Boat Ride on Galilee, Mass at Capernaum to Discovering Mary at Visitation to Jerusalem. 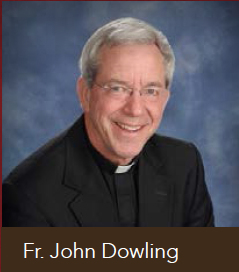 Great Body and Blood homily right where Jesus gave that teaching. Great day. Homily here. Enjoy! I must tell you dear Elizabeth, Steve Ray’s Holy Land trip was even better than I could have imagined. It could not have been done better! First, let’s start with the preparation. All the materials sent in advance, the preparations — all functioned flawlessly. I wrote to you about this in a previous email. From the start, we were treated like royalty and it never stopped. From my experience, Amer was the man-on-the-ground whose job it was to make sure everything happened, and it happened on time without a hitch. If that man or any member of his family showed up in the LA area, I’d take off work if necessary, travel to wherever he was and take him and his travel companions out to a great dinner at a fancy restaurant in an attempt to return the favor for his unbridled hospitality. Wow was he great! A storehouse of knowledge with an intimate connection to the land. And Stephen and Janet Ray. Where do I start? Steve’s done this so often and so well, he makes the complex seem effortless. Janet made sure we didn’t get lost or separated from the pack. With all the contacts that he and Amer have, we were able to do things that few could do. How many of the pilgrims get to celebrate Latin High Chant Mass at the Tomb in the Church of the Holy Sepulchre for 50. Breathtaking. The experience of a lifetime. And the people from the Food Donation Connection. They were so friendly and pious. My wife Merle and I will never be the same. I’ve told all my friends about this trip and told them explicitly “You should go”. So thank you Elizabeth. Thank you Amer and your family, Thank you Steve and Janet Ray. Thank you Bill and Sue for all that you’ve done for Merle and I.
I hear there are plans for a Part II trip in February of 2020. I told Bill — count Merle and I in. Watch the entire 90 Minute Pilgrimage Video below, or download it to a flash drive to watch on your HD television. 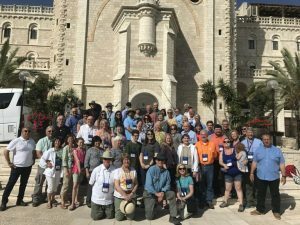 April 2017 Holy Land Pilgrimage from Steve Ray on Vimeo. It was an exclusive one-bus trip for the members of the Food Donation Connection. 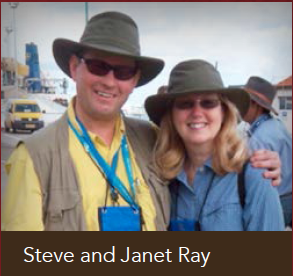 This Holy Land Pilgrimage is like all other Signature Footprints of God trips, known for excellent organization, leadership and teaching from pilgrimage experts, Steve and Janet Ray. For a more personal experience we limit the group to one bus to foster the closeness and intimacy you would expect of a top tier pilgrimage. We do not put you through dinner buffet lines everyday but on three days we will take you to some of the finest restaurants with lots of local flavor and cuisine with wine and drinks provided during all dinners. We also make every effort to support the local Christians which make up only 1.5% of the population. 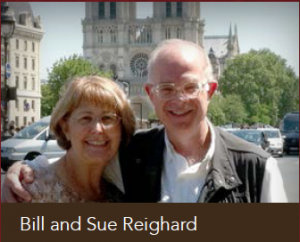 Bill and Sue Reighard founded Food Donation Connection in 1992 in response to the challenge of Jesus in John 6:12 to “Let Nothing be Wasted”. With this statement as its vision for the past 24 years, FDC has developed systems and technology enabling thousands of donors with surplus food to donate this food to thousands of hunger relief organizations in the US, Puerto Rico, Canada, Ireland and the UK. This trip will allow FDC to celebrate 25 years of service by visiting the site where Jesus made this request.